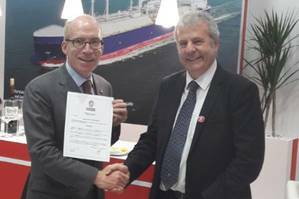 Bureau Veritas has formally issued GTT with an approval in principle (AiP) for the development of a new liquefied natural gas (LNG) cargo containment system (CCS) evolution of the NO96 range. This CCS, named NO96 Flex, benefits from the NO96 proven technology as well as the use of an efficient foam panel insulation. The AiP was delivered at Gastech 2018 in Barcelona on Monday. The NO96 Flex CCS insulating panels are mechanically anchored to the inner hull, and the double metallic barrier concept remains with an unchanged secondary Invar membrane but with an evolution of the primary membrane this is changed from Invar to corrugated stainless steel. The use of PU Foam at primary and secondary levels will allow an LNG boil-off rate reduction down to 0.07%V per day for standard 174,000 m3 LNG carrier. Since the beginning of this development in 2017, GTT has been in constant exchange with the major yards constructing NO96. A mock-up phase is expected to begin in the first quarter of 2020. Philippe Berterottière, Chairman and CEO of GTT, said, "With the development of NO96 Flex technology, GTT once again demonstrates its philosophy for continuous improvement of its proven technologies."